Congratulations to Rem and Hachiman to win Tiara and Scepter !!! Congratulations to Senjougahara Hitagi and Alphonse Elric to win Divine Circlet and Crown ! Also, congratulations to Violet Evergarden to win the All-Star Seasonal Battle ! Thx. But then, is guessing future Tiara and Scepter more and more hard now? 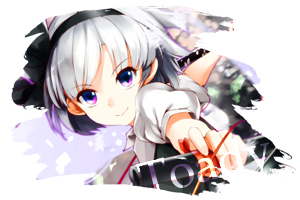 Last edited by Summer Pockets on Tue Feb 12, 2019 6:46 am, edited 1 time in total. Certified official by the Bedlam on Baltic Avenue, news report forthcoming. 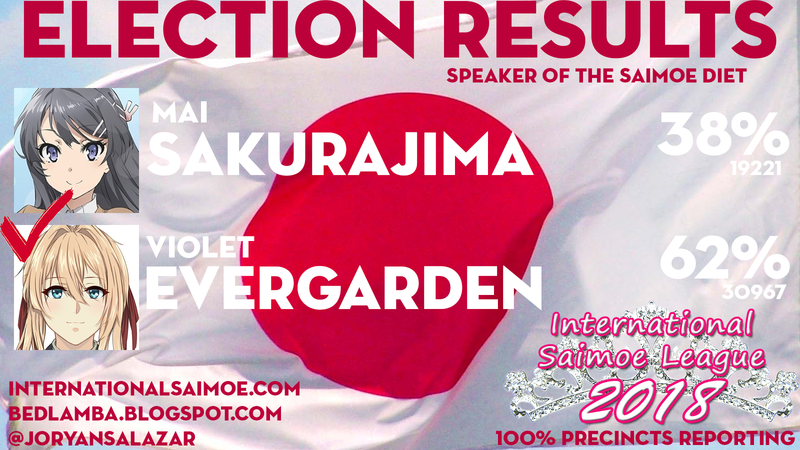 ISML 2018: Rem Elected Saimoe Prime Minister! 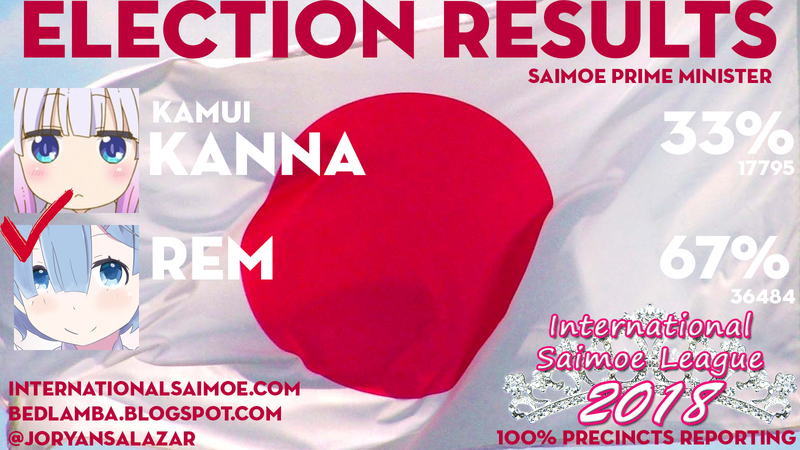 Match Days 8 and 9 of the 2019 International Saimoe League Postseason were combined into Election Day 2019, and Rem has been elected Saimoe Prime Minister for 2019, routing Kamui Kanna 36484-17795. 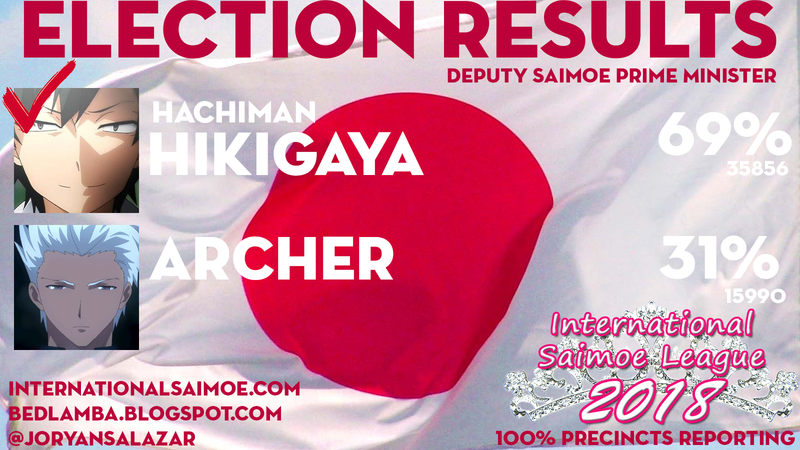 Hachiman Hikigaya will be your new Deputy Saimoe Prime Minister after putting Archer to the sword 35856-15990, while Violet Evergarden has been named Speaker of the Saimoe Diet after a 30967-19221 belting of Mai Sakurajima. In particular, Evergarden will have a special role of being a saimoe-exclusive aide to both the Japanese Imperial Household and British Royal Family with Arthuria Pendragon, Saber, as a veteran assistant. This result is also named as the final Upset of the Round for the 2018 International Saimoe Season. 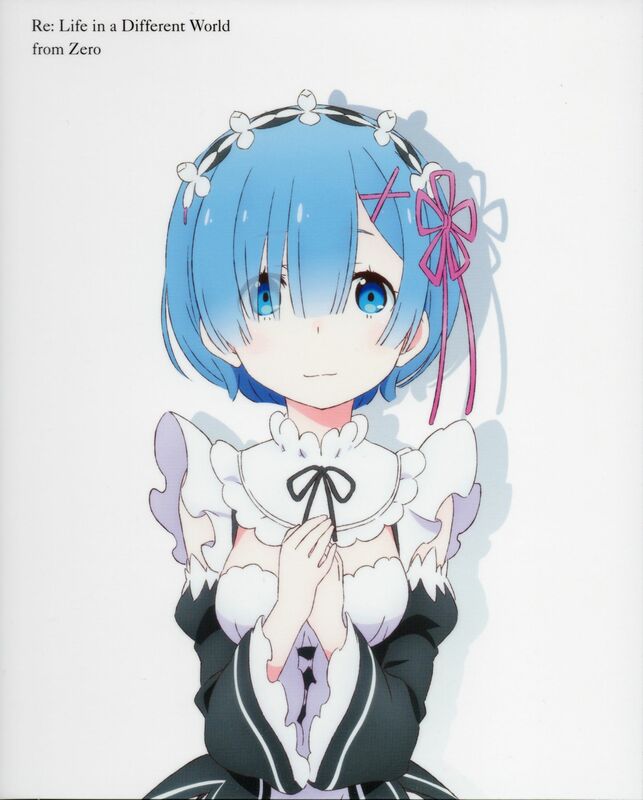 Rem, who will be sworn in under the name Rem Natsuki, Hikigaya and Evergarden will sworn in during Golden Week 2019 in Japan. Kaede Azusagawa finished in third place in the 2018 ISML Autumn Seasonal with a 23057-21671 victory over Alice Zubeg. Hitagi Senjougahara won the ISML Divine Circlet Female Division with a 27188-16810 win over Akame and in the Male Division, Alphonse Elric reigned supreme over Tsunayoshi Sawada, 21903-21077. The top 16 characters in the male and female divisions form the Saimoe Cabinet for the forthcoming year and Election Day finalize the seating order on the Male and Female sides. Yukino Yukinoshita finished in third place with a 25603-21145 win over Asuna Yuuki Chtholly Nota Seniorious, the outgoing speaker of the Saimoe Diet, complete a strong debut campaign with a 23193-22910 thriller over Mashiro Shiina to finish fifth. Rikka Takanashi pounded Nanami Aoyama 26978-20986 for seventh, Emilia completed a ReZero sweep with a 28693-17376 hiding of Shiro for ninth, Rin Tohsaka outlasted Saber 23663-20811 for eleventh, Sakura Kinomoto won the closest race of a round, a 22808-22791 nailbiter over Sagiri Izumi for thirteenth, and Chiyo Sakura prevailed over Schwi Dola 22763-22044 to finish fifteenth. In the Male Division, Levi Ackerman leveled Riku Dola 23991-21009 for third place, Rintarou Okabe was fifth after tearing down Shouto Todoroki 25501-19323, Nagisa Shiota defeated Willem Kmetsch 23125-21179 for seventh, Taki Tachibana cruised past Shirou Emiya 23719-21003 for ninth, Yuuta Togashi punched Saitama 27635-19368 for eleventh, Touma Kamijou broke Astolfo 23057-23182 for thirteenth and Takashi Natsume finished in fifteenth place after easing past Li Syaoran 22791-21280. In other seasonal action, Index L. Prohibitorum won a 22186-22123 snoozer over Kuon Ohara, Rio Futaba defeated Narumi Momose 23323-20579, Ichigo cruised past Suzuha Amane 23244-20449 and Rikka Takarada finished the campaign on a winning note, getting the last laugh with a 23447-21167 smashing of Rinne Ohara. Index, Futaba, Ichigo, and Takarada join Sakurajima as members of Evergarden's special advisory council. Thus concludes the 2018 International Saimoe League, with Rem, Hachiman Hikigaya and Violet Evergarden steering the ship forward into 2019. Be sure to keep voting for your favorite candidates at InternationalSaimoe.com and join the ongoing debate. And be sure to tune in to The Bedlam on Baltic Avenue, your home for coverage of the 2019 International Saimoe League, the world's premier anime character competition since 2008. Last edited by Hachiko on Tue Feb 12, 2019 8:43 am, edited 2 times in total. But it is because of you, I remembered who I am and I maintained my promise to pay you back for your belief in me. The best I can do to repay you...is to do my work as Saimoe Prime Minister to the best of my ability. This isn't a Royal Election I was a part of. This was bigger than me, Emilia, my sister...it encompassed so much and it was a struggle. But I told myself to be positive, be assertive, be aggressive in what I want to become, because if I do that, fate will take care of the rest. It is because of you, I am here as your Saimoe Prime Minister, and I will not let you down. You, my wonderful fans and even those who supported Kamui—and just wanted to add, I called Kamui on a great race and she happily conceded so now she can go ahead and bully Tooru anytime she wants (laughter)—no, but seriously, those who supported Kamui and others, I extend my hand of solidarity and ask for your help and cooperation in leading our movement forward. I cannot do this alone, and I won't. 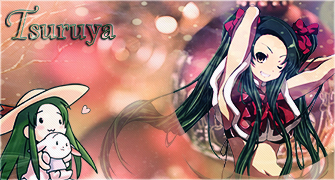 We, the members of Saimoe, the finest people you will ever be one with anywhere, need you to be with us and support us. I am just one person, Hachiman is another, Violet is another...we need you to stand with us in this year of transition. We will be having a new emperor take over when I am sworn in with Hachiman and Violet. We need you to show your support for the future Emperor, Naruhito, and his vision for the Japanese nation going forward. Also, I have believed that the promotion of time-honored Asian values can be applied anywhere. What are those, you say? It's four parts: social harmony, socio-economic prosperty and collective well-being of community, loyalty and respect for elders and authority, and a preference for collectivism and communitarianism. Basically, it's putting the team and the world above you. No man or woman is above the law, not even me, I merely enforce and promote it. But it's not rocket science, ladies and gentlemen. Respect your parents. Your mother, your father, your grandparents, uncles and aunts...these are important parts of your life, your family. Do what you can to make them proud of you. Your siblings, your children, make them happy as well. And take the advice of those who have been in this world longer than you in stride. Violet has done a remarkable job immortalizing the stories of great people in writing for all to read and she is just getting started. She will write your story too, all you have to do is ask. Never be headstrong in a decision. Make sure the team is on board. And this is what we do during meetings of our Diet, the Saimoe Parliament, or Saimoe Diet. We are an all-star team with unselfish minds when we need to go in one direction or another. We are not like that government in the West where two factions continually fail to make progress due to pride and selfishness and pettiness. We make decisions regarding new ways to promote our culture to satisfy the demands of the West and elsewhere. And those who don't get their way ultimately come around and support the consensus. That is the power of the collective aspect of Asian values, and I mean to promote it and encourage it as values that the world can adopt. I want to close my address by saying that it will not be easy for us moving forward. Mikoto Misaka is the incumbent Saimoe Leader of the Free World and my personal advisor to all matters related to the finest people-us. She said this: "No matter what, you’re not defective. There’s nothing wrong with you, so don’t give up.” Motivate yourself to be at your best. Self-actualization leads to positive thinking and assertive confidence. And we will make it a lifelong commitment to serve you and motivate you to be successful in whatever, or whoever, you want to be as long as it makes your family, your community, your city, your country, and the world proud. So thank you, we salute you and honor you. May God bless you, and may God bless Japan and the world! Last edited by Hachiko on Tue Feb 12, 2019 8:46 am, edited 3 times in total. In particular, Evergarden will have a special role of being a saimoe-exclusive aide to both the Japanese Imperial Househole and British Royal Family with Arthuria Pendragon, Saber, as a veteran assistant. This result is also named as the final Upset of the Round for the 2018 International Saimoe Season. 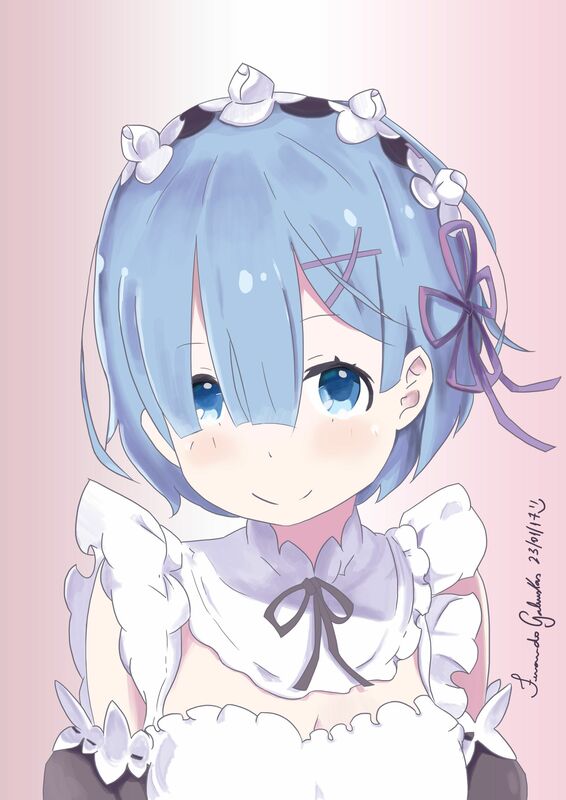 Rem, who will be sworn in under the name Rem Natsuki, Hikigaya and Evergarden will sworn in during Golden Week 2019 in Japan. In the Male Division, Levi Ackerman leveled Rikuy Dola 23991-21009 for third place, Rintarou Okabe was fifth after tearing down Shouto Todoroki 25501-19323, Nagisa Shiota defeated Willem Kmetsch 23125-21179 for seventh, Taki Tachibana cruised past Shirou Emiya 23719-21003 for ninth, Yuuta Togashi punched Saitama 27635-19368 for eleventh, Touma Kamijou broke Astolfo 23057-23182 for thirteenth and Takashi Natsume finished in fifteenth place after easing past Li Syaoran 22791-21280. Mai SHOULD have won, not Violet! It was a spread-busting result. But you have a relative typing workhorse taking over for Chtholly. It's like for like and I can understand why the voters chose to go with Madame Evergarden. Ironically, Rikka gets a little bit of payback by finishing her campaign with a win. RichardJoash, if you have reason that how Rem's 30K+ votes are having contrabands, and you have enough evidences (screenshots, text records, videos, ...) to help judging your claim, feel free to contest the results (per chapter XIII.C. ), but without evidences, I think Rem and their fans aren't problemic en masse. The only thing which I'm a little depressed is, Rem is indeed the fourth Tiara winner that named without "K". Last edited by liuxinyu970226 on Tue Feb 12, 2019 9:14 am, edited 4 times in total. Yukino better follow up soon! Ahhh, but Saimoe goes on. Please look forward to coverage of the 2019 edition. From The Bedlam on Baltic Avenue, where there's always something on down there. 894/1471	(60.77%) in voted won/total voted for me, consider that a good year. Okay, I understand that but I am not talking about Rem, I am talking about Mai Sakurajima because she IS the true winner of the All-Season Tournament, not Evergarden. NB: This is the worst day of my life. If you do not deal with this problem, it's okay. Last year Kanna lost at same match against Chtholly and in the end Kanna got further in PostSeason this year ~ Mai may have been defeated but she can recover and fight for Tiara next year (and take her revenge). I hope she gets a necklace in 2019.